GNU Midnight Commander (also known as mc, the command used to start it, and as mouseless commander in older versions) is a free cross-platform orthodox file manager. It was started by Miguel de Icaza in 1994 as a clone of the then-popular Norton Commander. GNU Midnight Commander is part of the GNU project and is licensed under the terms of the GNU General Public License. Midnight Commander is a console application with a text user interface. The main interface consists of two panels which display the file system. File selection is done using arrow keys, the insert key is used to select files and the function keys perform operations such as renaming, editing and copying files. Later versions of the Midnight Commander additionally have mouse support. Such versions are aware of GPM and X terminal emulators (such as GNOME Terminal or xterm) which support mouse reporting. When running inside an X terminal, these versions can update the name of the window in which Midnight Commander runs (if allowed by the terminal emulator). Midnight Commander's features include the ability to view the contents of RPM package files, to work with common archive formats as if they were simply another directory, and to function as an FTP or FISH client. Midnight Commander also includes an editor called mcedit, which can be executed as a standalone program or from Midnight Commander using the F4 key. mcedit's features include syntax highlighting for many languages, macros, code snippets, simple integration with external tools, automatic indentation, mouse support, a clipboard and the ability to work in both ASCII and hex modes. Users also have the option to replace mcedit with the editor of their choice (Options Menu>Configuration>[Don't] Use Internal Edit). 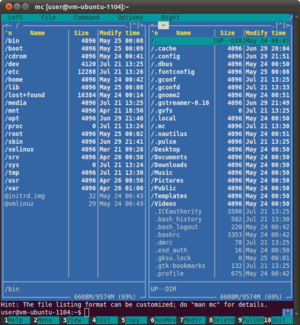 Midnight Commander is based on versatile text interfaces, such as Ncurses or S-Lang, which allow it to work on a regular console, inside an X terminal, over SSH connections, over an RS-232 interface (for embedded devices) and all kinds of remote shells. Native support for UTF-8 locales for Unicode was added in 2009 to development versions of Midnight Commander. As of version 4.7.0, mc has had Unicode support. ^ a b Bezroukov, Nikolai (2011-12-16). "History of development of Midnight Commander". softpanorama.org. Retrieved 2014-09-20. ^ "Releases · MidnightCommander/mc". Retrieved 1 January 2019 – via GitHub. ^ "LINGUAS". Midnight Commander. September 2011. Retrieved 9 March 2012. ^ Miguel de Icaza [@migueldeicaza] (9 December 2015). "Midnight Commander was originally "Mouseless Commander", then "MouseLess commander with Mouse Support" then "Midnight Commander" via a vote" (Tweet) – via Twitter. ^ Petreley, Nicholas (20 August 2002). "Favorite minimalist file managers". LinuxWorld.com. Archived from the original on 28 October 2002. Retrieved 3 May 2015. Wikimedia Commons has media related to Midnight Commander.